It’s time to delve into reviewing the wonderful world of the Twilight Saga. This series was my initiation to the Vampire Paranormal Romance world, and my most memorable reading experience in ages. I indulged in this series, escaping the real world for almost 3 weeks straight. Everyday, I’d recount the latest “Twilight” escapades I had read from the night before, to my colleagues (and thankfully, they humored me by seeming interested). I remember how my curiosity was only slightly peaked, when the commercials for the movie were playing on TV, and my husband would groan and roll his eyes each time a trailer aired. I asked him what the big deal was, and he said it was the latest fad that everyone was obsessing over. I shrugged it off (as I was not into Vampire movies), and continued on with my life. I think that helped get her out of her funk, as she immediately started to recount what the story entailed, and told me that I absolutely HAD to read the series. She promptly decided that the books would be a part of my Christmas present, and my December was a blur of Vampires and Christmas lights! While I’m certain that most of you have already read the main book, or even the entire series, recounting the story is fun, so I will! The book is set in Forks, Washington (considered the most cloudy area in the U.S.). It is about a teen girl named Bella, who moves into her father’s home in Washington, and is about to be the “new girl” in high school. Bella is a solitary soul, shy yet pretty, and seemingly uninterested in becoming a part of the “in-crowd”. Despite being uncoordinated and slightly clumsy (in sports and in life in general), she still manages to become popular pretty much on her first day, as most of the boys in school are intrigued by her, and most of the girls seem to welcome her. One particular group of students peaks her interest, however. A beautiful, highly fashionable group of five, that she notices in the cafeteria. Her new friends let her know that they are a “family” (foster kids that live with their uncle, a renowned surgeon in town). She is told that they do not mix with the other students at all, and is given the impression that this particular group is impenetrable (which in essence, has been true). She notices that the one out of that group that she is drawn to (Edward – who is also the one that ALL the girls are drawn to), stares at her intently, yet somewhat unkindly. That day, she discovers that she is in the same science class as “Edward”, and of course the only seat available in class, is the one next to him. Despite the fact that she is quite self conscious, and already nervous around him (as is everyone), she takes her seat next to him. To her dismay, she notices that he reacts with horror at her proximity. His eyes seem cold and black, glaring at her with pure disdain. He moves to the furthest edge of their table, to be as far away from her as possible. He appears to hold his breath and his hands clench the table as if he is struggling. His body language personifies disgust, and she is humiliated. By the end of class, he runs out of the room like a bat out of hell, and her new friends comment on his strange reaction to her. As the day progresses, she has another unpleasant encounter with Edward, and by the next day, he is completelymissing in action (and also missing for an entire week). Now she is certain she is the cause of his reactions, and is highly insulted and hurt, but accepts this as part of his group’s “weirdness” and goes on with her new routine. A week later, Edward is back, and her heart stops when she sees him again. As she approaches her seat next to his, she is startled when he kindly acknowledges her. His demeanor is completely different, and their friendship begins. The friendship goes through that shy crush stage, where the two characters watch each other from afar, and then eventually seek each other’s company any way they can have it. Despite Edward’s attempt at keeping his feelings for Bella in control (for her own good), he finds that he is falling in love with her, and she does not make it any easier for him, when she gladly accepts and returns his love. As they get to know each other on a deeper level, she discovers his (and his family’s secret), the dangerous urges he fights when he is with her, and the struggles they have to face to stay a couple (along with the danger she faces when she enters his world. Not all of his people are nice). “I’ll figure it out eventually,” I warned him. “I wish you wouldn’t try.” he was serious again. There are so many beautiful points about this book, that the best way to present them is via direct quotes. The words that make up the emotional closeness that the two experience as they get to know each other, is so much deeper than I could actually put into words myself. The book is so carefully detailed, so lovingly described that you actually feel like you are there. I think, the reason this book touches us so deeply, is that we can all relate. This book is about the kind of “first love” or “true love” that everyone has experienced or wishes to experience at some point in their life. You know the kind of love, when a new couple can simply not get enough of each other. There are no faults, simply complete acceptance, and unconditional love. When Bella and Edward have that first conversation, driving home at night, regarding his secret. His lips twitched as he stared at the road. “A while,” he admitted at last. “Do you truly believe that you care more for me than I do for you?” he murmured, leaning closer to me as he spoke, his dark golden eyes piercing. “Welcome back,” he murmured, taking me into his arms. He rocked me for awhile in silence, until I noticed that his clothes were changed, his hair smooth. Okay, well the book simply needs to be read for full impact. For those of you who are here and haven’t read this yet – what are you waiting for? Hop to it!! There’s action, adventure but mostly *LOVE* – For those of you who have groaned and rolled your eyes throughout this review – if you read it, and if you let it, this book will warm your heart! This book was incredible! It had me so entranced, intrigued, craving more and more. The author’s use of adjectives is unfathomable. She captures you and makes you feel as if you yourself are Bella, waiting on Edward’s next move. I can’t wait to start reading “New Moon”! I am so happy that influenced you in this adventure that you have embarked! it is such a pleasure for me to come and read all your reviews on so many books that I would not have discovered if you had not started this blog! I love you Sweetpea! made me cry! histerically!!! i memorized it!!! i ADORE the twilight books! im way over emotional though, so my mom will come into my room one day while im reading and i’ll be in histerics and she’ll be like “maybe you shouldn’t read thoes books they seem to make you sad.” I <3 EDWARD!!!! Have you seen her book the host? It is slow going in the beginning but if you can stick with it, it is so romantic i could’nt put it down. Its not about vampires but it has a good twist at the end, hunky sounding men and a love triangle all the way through i highly recomend this book!!! oooooh sounds excellent! Love triangles are always fun!! My husband bought it for me LAST Christmas (since he knew how much I loved her) and it is still sitting on my TBR pile. Now I wanna read it. I’m sooo happy that Twilight became a hit. Everybody in the office are talking about it but I never paid much attention. Until I saw the movie! That is when I started to read the series 1 month straight. And I was sooo in love with the story. It doesn’t focus on the primary characters only, You will surely love all the characters. It’s the kind of book that you would memorize every name you read. Kudos to Stephenie Meyer. Oh I LOVE this series still. I’ve only read it once, but it is what introduced me to the genre, and I haven’t been bored since! Hey Tracy? Have you read “The Host” by Stephenie Meyer yet? SOOOO good. Made me sob! I’m sorry, but Twilight? Really? This is the type of book that will NEVER become a classic piece of literature, despite how popular it is now. I respect everyone’s right to have their own opinion about the quality of the book, but still disagree strongly. 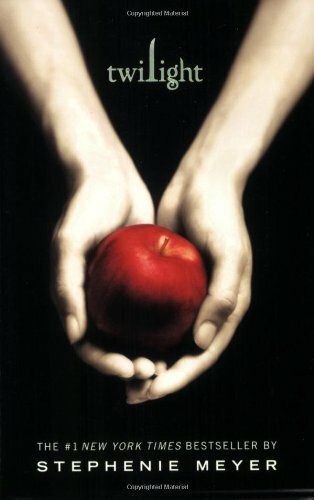 The first time I read Twilight I fairly enjoyed it, but the second time I was surprised at the boring writing style. It was dull, slow paced, and quite unimaginative. I guess most readers (including myself at first) don’t notice the low-quality reading because they are distracted by sparkly vampires. Maryse, I whole-heartedly agree with your entire review. I read the entire series in 8 days over this past spring break. My friends at work couldn’t believe I hadn’t read it. I kept saying, “I’m not 16 and I don’t do vampires!” What was I thinking!!!?? Since then I have read TONS of books (mostly because you’ve suggested them!!) and have fallen in love with many different stories and characters…Kellan Kyle I ADORE you!…but there is something about the story of Edward and Bella that is so pure and so magical that even when I think about it now, it still takes my breath away just like it did the first time I read it!! @Sarah…if you weren’t such a fan of the series, why would you choose to read it twice? I have read the Twilight series 11 times through. It was the first vampire book I had ever read and it got me hooked!!! Every time I have read them I have seen something a little different. Then I got into the Vampire Diaries series, and was not disappointed!! I am turning 48 it his month and I am not ashamed to admit that I love these books! !